Note the "smiley face" key Shaun Tan has digitally added to the far right end of the lower bank of the keyboard. The Powerhouse Museum in Sydney has this Cheapside (Rimingtons, London) Blickensderfer Featherweight listed as a Blick 5, which of course it is not. Not quite as silly a mistake, however, as the nearby Mitchell Library exhibiting Patrick White's Optima portable typewriter as an Olivetti. 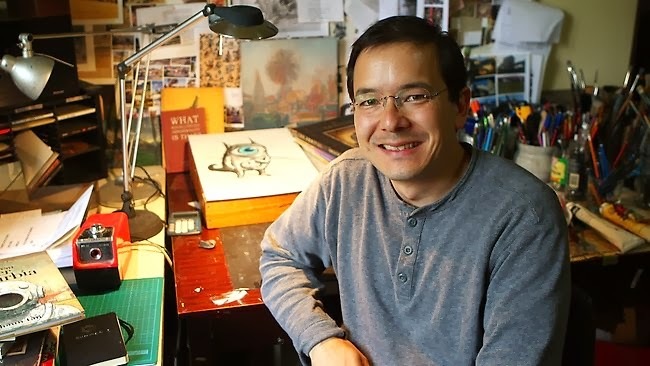 Two years ago the Powerhouse Museum in Sydney, hoping to regain touch with some of the younger generations, commissioned the brilliant Australian children's storyteller and illustrator Shaun Tan (below) to "have some fun" with a few of the museum's tens of thousands of donated items. The result was The Oopsatoreum: Inventions of Henry A. Mintox, which followed a successful exhibition of curiosities called "The Odditoreum". Tan was approached "with a concept for another show involving fictional histories of real (but often quite strange) objects from their archives. While 'The Odditoreum' wandered randomly from medieval cannonballs to generically engineered moths, [the] idea for 'The Oopsatoreum' involved more of an overarching narrative, with some emphasis on mechanical objects and accidents. I responded with the character of an imaginary inventor, Henry Archibald Mintox (1880-1967): spectacularly unsuccessful and therefore largely unknown, at least until this museum 'retrospective'. "Many of the actual objects, from a hearing-aid to a mechanical dog, are recast as failed innovations. 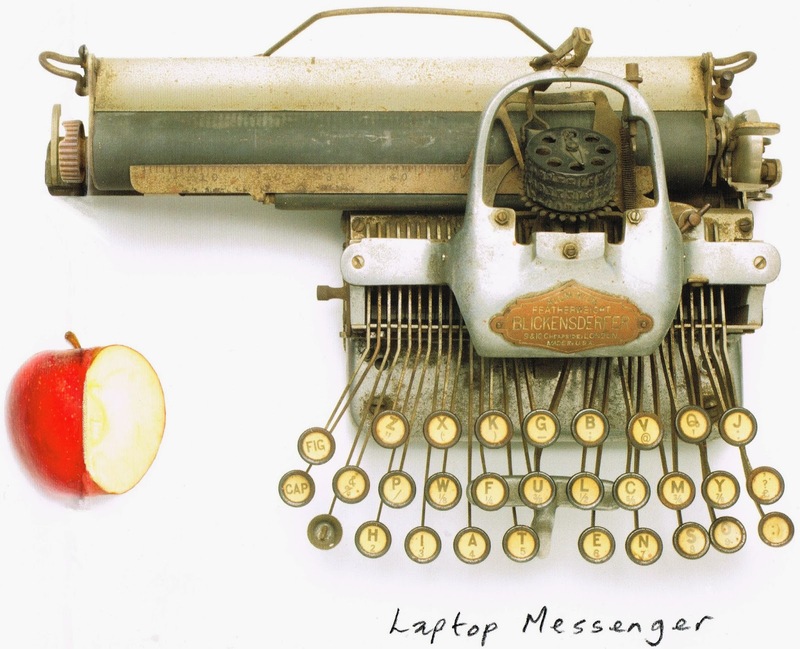 In some cases being too far ahead of their time, such as an early attempt to introduce mobile text-messaging using pre-electronic technology [the Laptop Messenger]. "Beneath the silliness of the project there is actually an important observation: all invention begins as a daring act of imagination, and begins with a play of outlandish ideas. For every success that filters into daily use, there are countless failures that are as important a testament to creative spirit." 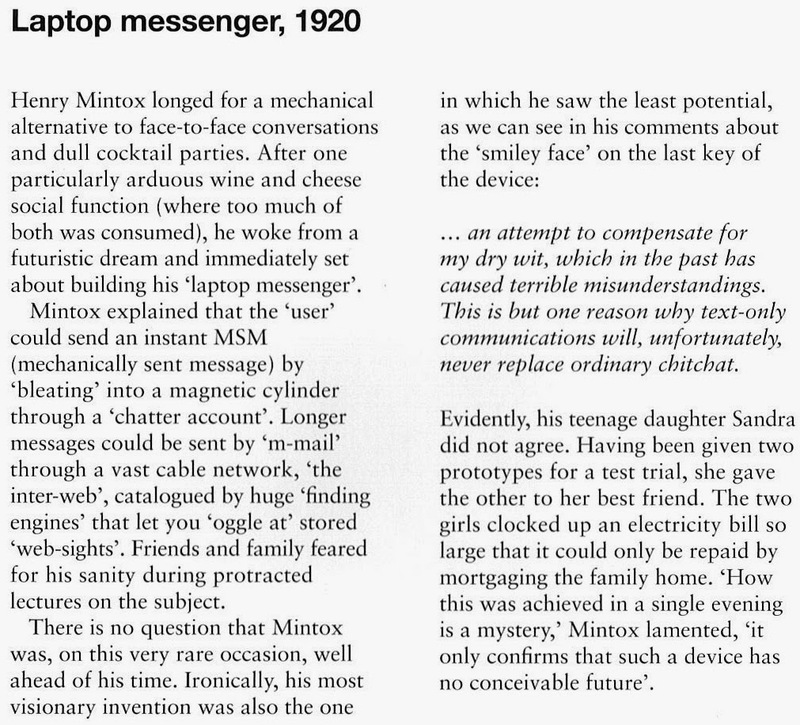 Tan's fictional tale of the "strikingly original Mintox" creates an inventor who "longed for a mechanical alternative to face-to-face conversations and dull cocktail parties"
"After one particularly arduous wine and cheese social function (where too much of both was consumed), he woke from a futuristic dream and immediately set about building his ‘laptop messenger’. Mintox explained that the ‘user’ could send an instant MSM (mechanically sent message) by ‘bleating’ into a magnetic cylinder through a ‘chatter account’. Longer messages could be sent by ‘m-mail’ through a vast cable network, ‘the inter-web’, catalogued by huge ‘finding engines’ that let you ‘oggle at’ stored ‘web-sights’. "Friends and family feared for his sanity during protracted lectures on the subject. There is no question that Mintox was, on this very rare occasion, well ahead of his time. Ironically, his most visionary invention was also the one in which he saw the least potential. "Evidently, his teenage daughter Sandra did not agree. Having been given two prototypes for a test trial, she gave the other to her best friend. The two girls clocked up an electricity bill so large that it could only be repaid by mortgaging the family home. ‘How this was achieved in a single evening is a mystery,’ Mintox lamented, ‘it only confirms that such a device has no conceivable future’." Shaun Tan was born in the port city of Fremantle, Western Australia, in 1974, seven years after Mintox's death - which happened to coincide with the donation of the Blick Featherweight to the Powerhouse Museum. It was not long after I was given The Oopsatoreum book by my family, at Christmas 2012, that I chanced upon a short animated film on TV one afternoon. 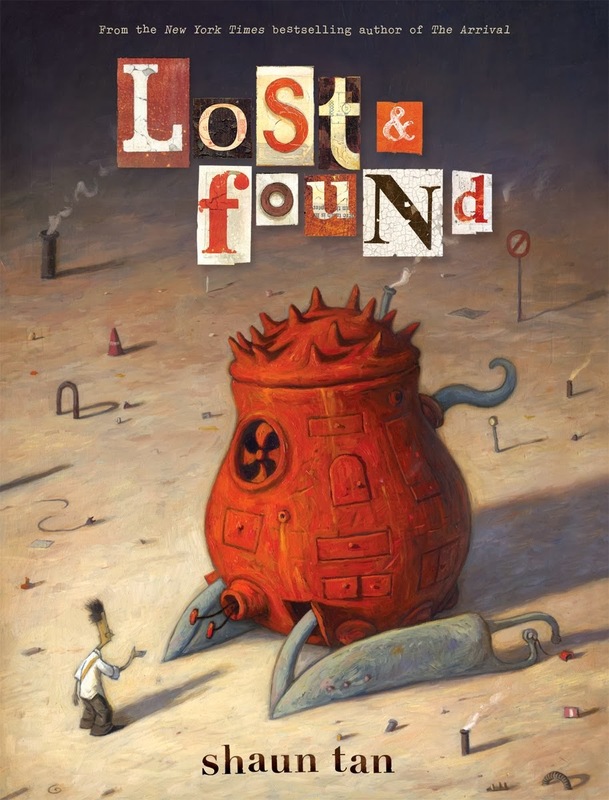 I was so deeply impressed by this film, The Lost Thing, that I took very careful note of the credits and spotted that the same Shaun Tan had written and illustrated the story. 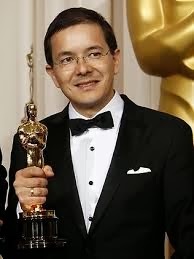 I am in no way surprised to find today that this film won an Oscar in 2011 for best animated short. It's without doubt the best animated short I have ever seen. Tan wrote the book, from which the film is adapted, in 2000. Tan moved to Melbourne in 2007. In 2010 he was the Artist Guest of Honour at the 68th World Science Fiction Convention in Melbourne. For his career contribution to "children's and young adult literature in the broadest sense" Tan won the 2011 Astrid Lindgren Memorial Award from the Swedish Arts Council. Tan's work has been described as an "Australian vernacular" that is "at once banal and uncanny, familiar and strange, local and universal, reassuring and scary, intimate and remote, guttersnipe and sprezzatura. No rhetoric, no straining for effect. Never other than itself." 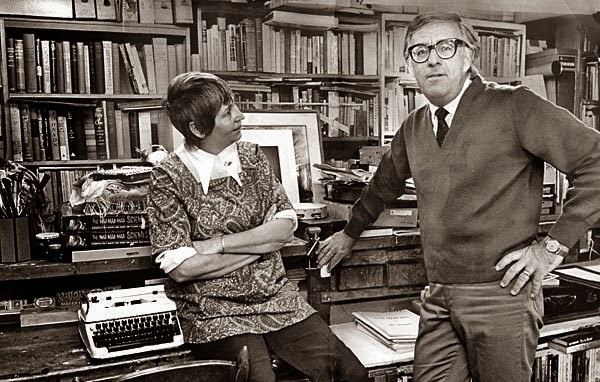 As a child Tan was inspired by Ray Bradbury. Tan's The Lost Thing reflects his interest in loss and alienation. He believes children in particular react well to issues of natural justice. in the Sydney Morning Herald, February 2, 2013. 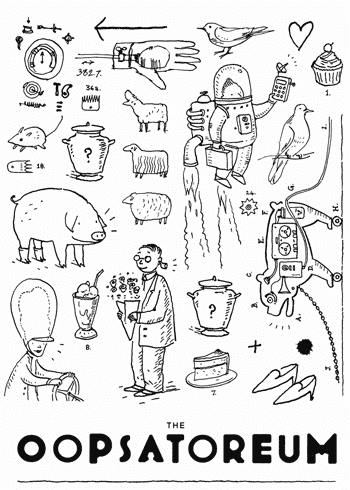 THE act of invention has as much to do with timing as it does ingenuity. In a shed in his backyard, fictitious inventor Henry A. Mintox tinkered into ''reality'' a large number of wacky contraptions that, in a practical sense, failed on every level. 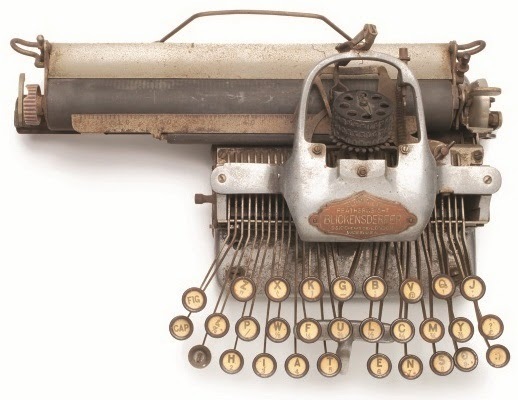 Sadly, he was a visionary with terrible timing, but had his prescient Laptop Messenger (1920), a lumbering machine similar to a typewriter (look for the smiley face on the bottom row of keys) that featured mechanically sent messages (MSM) and ''chatter account'', arrived in the right century, the name Mintox would be known the world over. 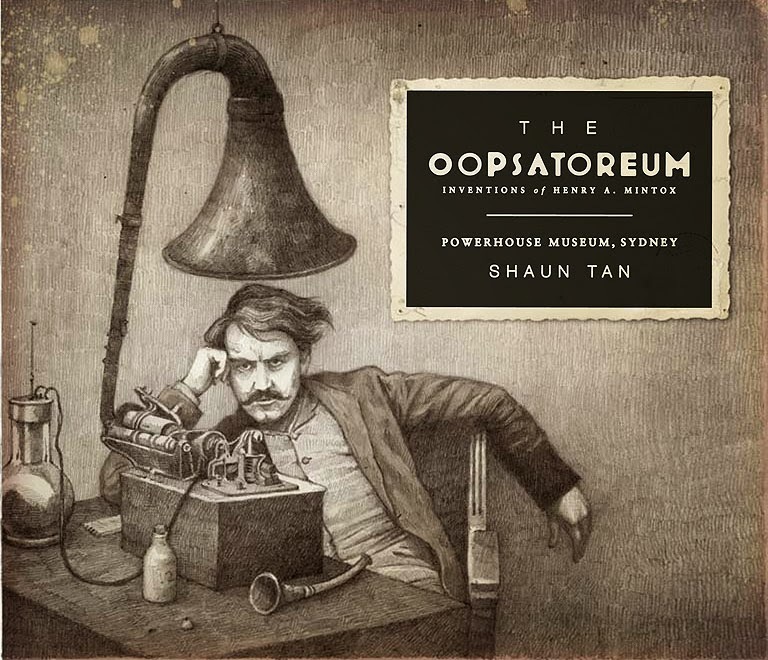 Selected from thousands of obscure objects housed in Sydney's Powerhouse Museum, the inventions featured in The Oopsatoreum really do exist (information about the real inventors can be found at the back of the book), but Mintox and the whimsical stories and drawings are all the work of author and artist Shaun Tan. The collaboration with the museum allowed Tan access to hundreds of objects, but only those that sparked his imagination made it into the book. Another invention featured is the Handshake Gauge (1951), a device that ''took the guesswork out of character judgment''. A prospective employee would shake a rubber hand and a dial would indicate whether the person was ''trustworthy'', ''steadfast'' or a ''corporate psychopath''. There is also the All-Purpose Clippers (1933), based on the idea of combining different businesses that ''economically share the same resources''. While the abattoir-restaurant combo never took off, Mintox created a device that could cut hair and shear sheep but, sadly, shears with an ''emphasis on speed, efficiency and preset styling'' failed to attract punters after a customer was ''accidentally kicked down a chute into a holding pen''. The blend of fiction and reality suits Tan's aesthetic; many of his books, especially his best-selling The Arrival, and his Academy Award-winning short film, The Lost Thing, have roots in reality but swarm with otherworldly creatures and contraptions that are both unfamiliar and completely recognisable. In The Oopsatoreum, Tan has written a convincing fictional biography that is charming and refreshingly original. But it is also pointed. ''What does it mean to be truly original?'' Tan asks. ''Should creativity be measured only by success?'' 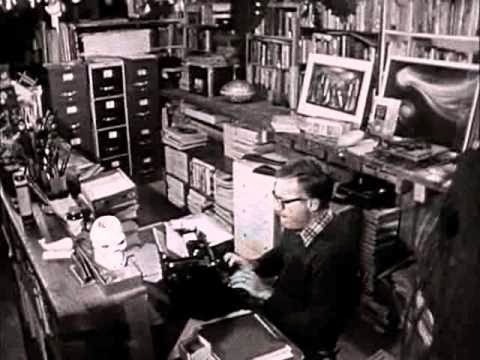 By the end of the book, you can only wish someone such as Mintox really had existed, although in a way the spirit of Henry Archibald Mintox represents everyone with an audacious fancy who has spent their lives attempting to manifest their dreams." This looks very clever. 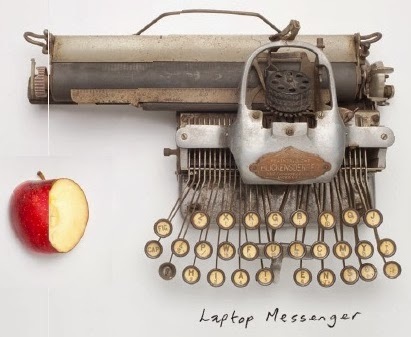 It took me a minute to think about the apple next to the "laptop messenger"! I am reminded of The Victorian Internet (I haven't read it yet, but Knotmagicknitter alerted me to it.